BVI Tourist Board is hosting a photo competition from August 9th to September 30th! There would be two categories, one for professionals and the other for amateurs. 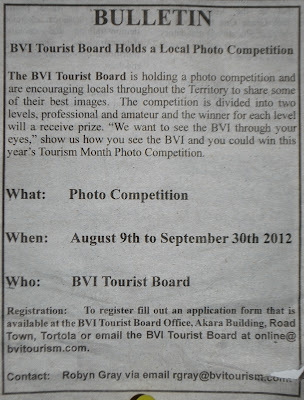 I would most definitely be entering this competition. 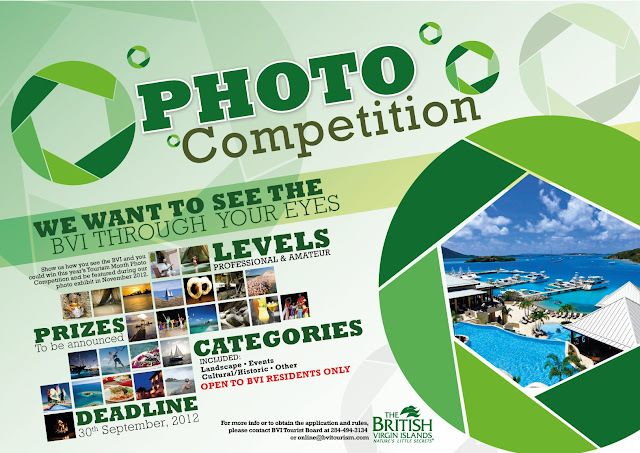 The theme of the competition is for viewers to see the British Virgin Islands from the photographer's point of view. Today as I was taking my daily walk I pondered, for quite some time, about what I should take a photograph of. As I was taking a shower after I had finished my walk, I got an idea. I was bathing in an inside/outside bathroom in a villa owned by Surfsong Villa Resort. You have to enter the villa to get access to the bathroom which has no roof and is enclosed by some beautiful rocks. When I first saw this inside/outside bathroom I was blown away, it is an ingenious idea! As I was taking my shower in this inside/outside bathroom, I was inspired for my photo for the photo competition!!!! 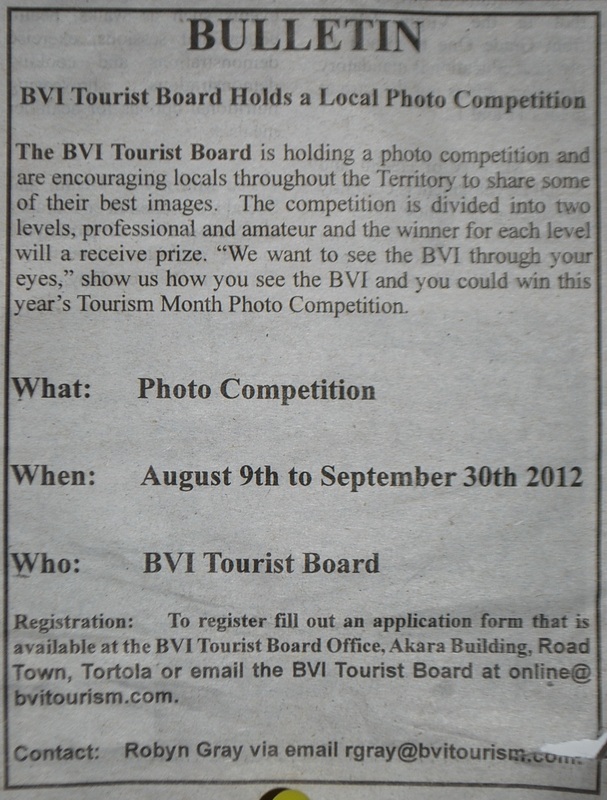 I want to do something different, averagely people will take pictures of sunsets, the beautiful beaches but I wanted to do something original and to the core of the beauty of the BVI! Wish me luck!!! My current photo gallery is hosted by Zenfolio but to be honest I am not pleased with the amount of traffic the site is getting. Why pay $50.00 per annum for bassically no traffic. I know what Site Build It can and has done thus far for my website (traffic and it increases every month) so I found a way to have SBI host my poto gallery - at no extra cost. Ever heard about Pretty Photo? The PrettyPhoto plugin ("pp") is what's commonly called a 'lightbox". It's really more like a gallery but it's not just for photos. Why I did not use Pretty Photo before going to Zenfolio? SBI templates did not really fall in line for what I wanted. It is only recently in one of SBI newletters, there was an article about creating a photo gallery using PrettyPhoto - BOOM! So here is my new New Photo Gallery I am really pleased with results. On July 23, 2012 (a very significant day for me) I went to the hospital in St. Thomas - you see my first grandchild - a boy - was about to be born that day. As I entered the waiting room I saw four young ladies (sisters) and they were all dressed very similar - short jeans skirt, jeans west coat. The jerseys were different, they even wore the same design slippers! They looked so cute. To me this meant that they all had a good relationship. For some reason they attracted my attention. They were waiting with their father for the arrival of their new baby brother??? There were well behaved. I was able to visit my daughter-in-law while she was in labour and when I was leaving her room, I saw another mother in labour as well and right away I knew that this lady was the girls mother. They resembled her! After a while these two fell asleep and I sneaked a photo of them. This is the first time I am downloading the photos that I took from my new iPhone. When I first viewed them (before downloading them) they looked out of focus - I almost deleted them. I eventually downloaded them to my computer and they look great! BTW my grandson, K'lam Marcus Vialva, was born at about 5:00pm but I had to leave about 3:00pm to get the ferry to return home (Tortola BVI). Ever seen the sticks that the Moko Jumbies walk on? Well here they are. I saw them at the car wash in Greenland, Tortola while I was having my vehicle washed yesterday. These sticks were used at the August Festival in East End, Tortola August 8, 2012. I think that the people who choose to learn to walk on these are very brave and talented. The second photo reminds of a shoe display at a show store!